Caesar Augustus was the first emperor of Rome and ruled from 27 B.C. 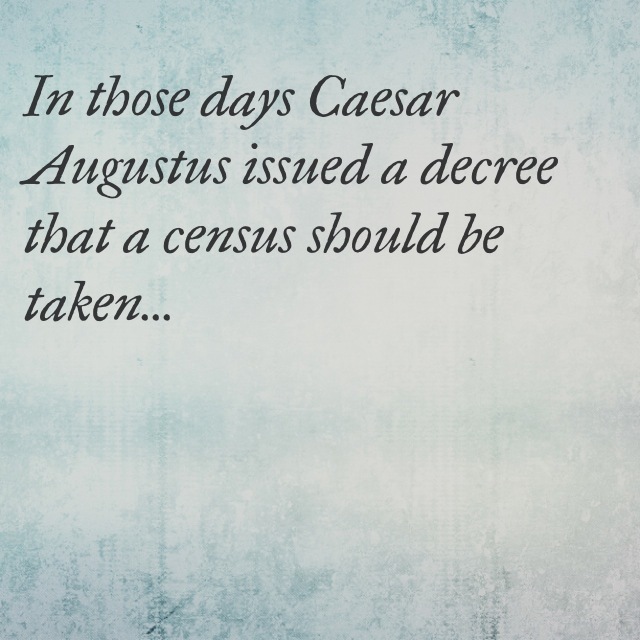 until 14 A.D. A census was taken in order to effectively tax all those living in the Roman Empire. Scholars believe Quirinius was in office for two terms – 6-4 B.C. and 6-9 A.D – and a census was taken during each. The prophet Micah prophesied that the Messiah would come out of Bethlehem. (Micah 5:2) The prophet Jeremiah prophesied that the Messiah would come from the line of David. (Jeremiah 23:5) Bethlehem was about 80 miles south of Nazareth. Does the historical context that Luke gives hold any importance to you as you read this passage? Consider what it would have been like for Mary and Joseph to travel 80 miles by foot and/or donkey in order to take part in the census. What would your response to such a directive have been? How would you have felt as you walked 80 miles? Where would your thoughts take you as you walked mile upon mile, knowing that the child you were expecting was the long-awaited Messiah? What kinds of fears? Doubts? Father, thank you for your Word. Thank you for the reminder that this is not a fairy tale, but that it happened in a real place, during a real time. Help me to remember, God, that Jesus was born into this very world that I live in, the same earth, the same sun and moon and stars. Help me to remember that Jesus is not a concept, a set of rules, a made-up character. Jesus happened in history and you used two human beings with hands and feet and fear like mine to carry out your purposes. I pray, Lord, that you would strengthen me for the assignment you have for me, that I can exercise strong faith and unbending trust to do everything you ask of me. Use my hands, my feet. Allay my fears. Settle my doubts. Rid me of my selfishness. Oh, Father, use me for your purposes in this world.